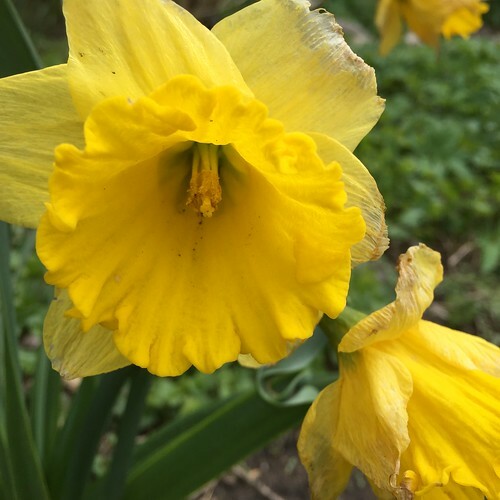 It's close to Garden Bloggers Bloom Day which happens on the 15th of each month, and in which I used to participate religiously but honestly, I am so not a scheduled person. Sure, I like to plan and have a loose set of goals because how else does one get things done? But tell me I have to be somewhere at a certain time and immediately the anxiety level rises. Maybe it's PTSD from working in a cube for so many years? I just don't like to be boxed in. I work along these lines: I need this and this done by this date. Okay! Anyway, I got the urge to capture Spring. 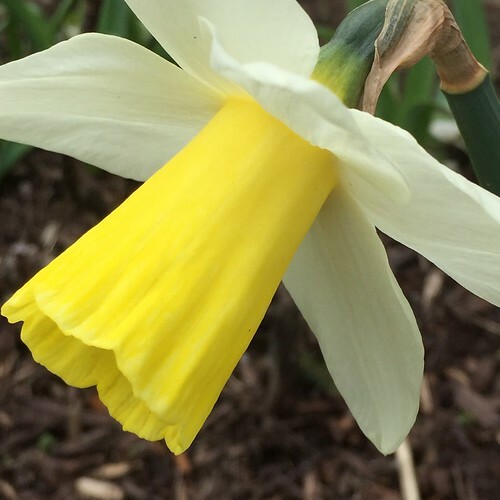 There's much happening in the garden in spite of the cold and rain and yes, even snow these past few days. Then I thought, why wait for GBBD? 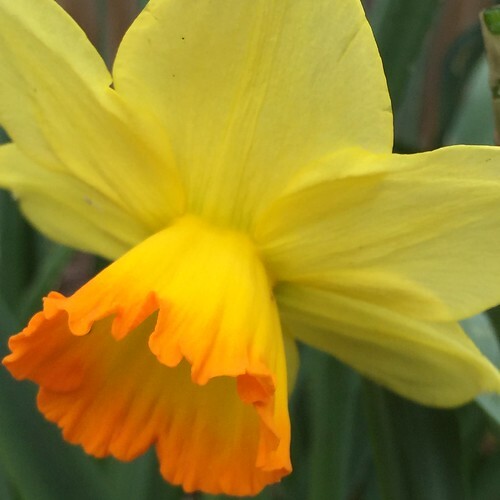 Why not just capture what's blooming in the garden when I feel like it? So, here you have it, what's blooming in the Violet Fern Garden right now. 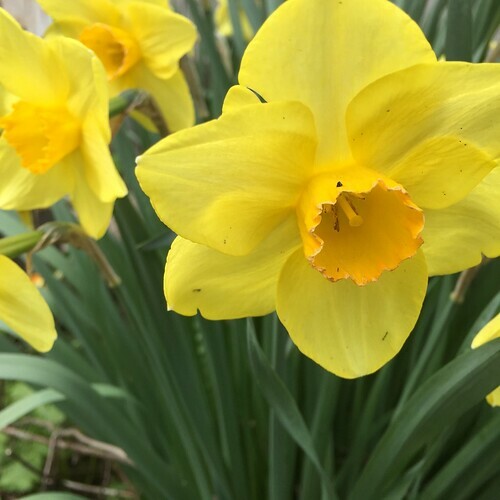 I have many, many daffodils mostly because nothing eats daffodils. I add some every year and I apologize but I don't keep track of what kind they are, or the names of them, as long as they "naturalize" they are in my shopping cart. I am surprised this year to discover I have some really pretty varieties! 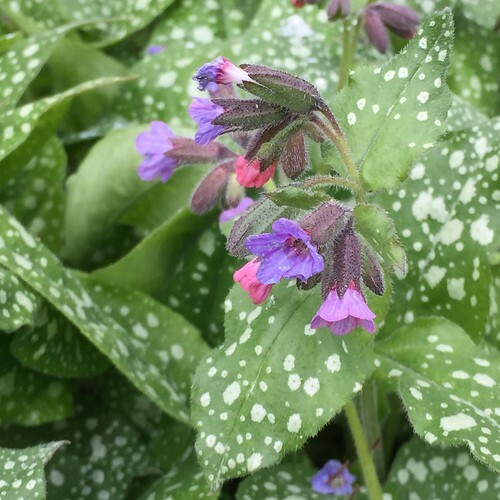 Lungwort or Pulmonaria always pleases. 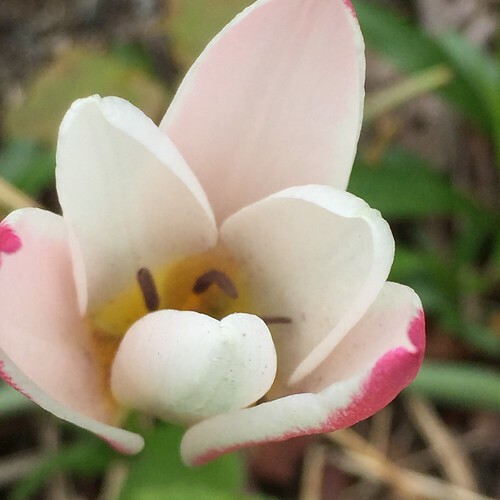 It is one of the first to bloom in Spring and she has been spreading itself around. She's welcome wherever she goes. 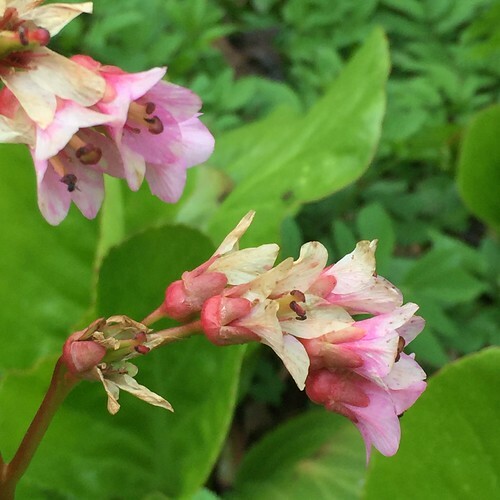 Bergenia is blooming! 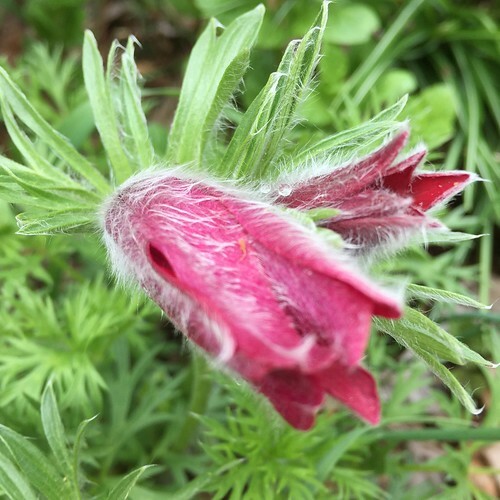 I have been trying her out in different spots because I love this early blooming perennial with its large, lush leaves that also put on a Fall show. She likes this spot if she's blooming for me, yay! I seem to have lost one of my Hellebores (so now I will need to get another one! ), such a shame, but this one is doing well and is still blooming! I finally got around to cutting back her old leaves so now she really is a looker! 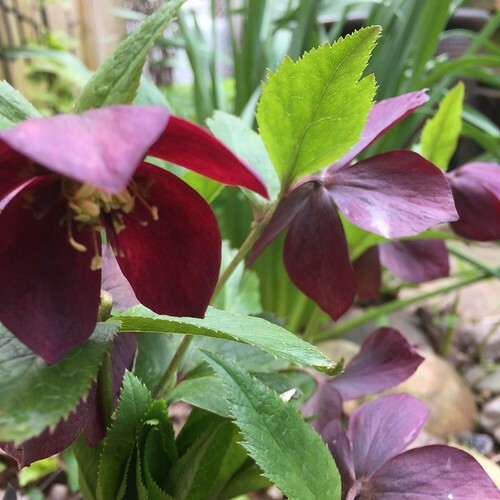 The only thing to rival that gorgeous burgundy color on Miss Hellebore would be Miss Pasque Flower. She is moping from all the rain we had but I'm sure she will hold her head up high soon. Little, polite Lady Jane is also in bloom. One of the few tulip varieties I have that big, fat rabbit doesn't seem to like. 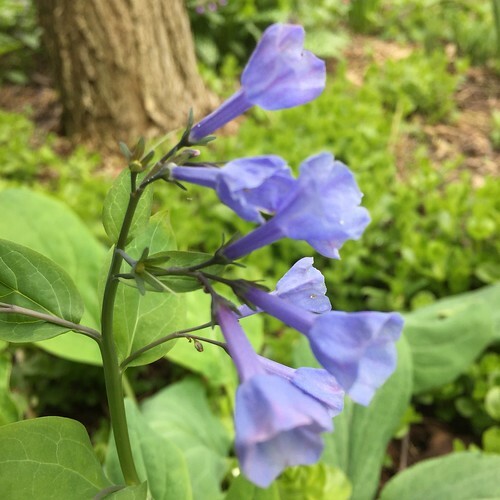 I've been trying to incorporate more native Spring ephemerals into the Violet Fern Garden. Some Dutchman's Breeches from the lake driveway has come back (jump for joy!) but isn't blooming just yet. Shooting star is up but isn't quite blooming yet, either. 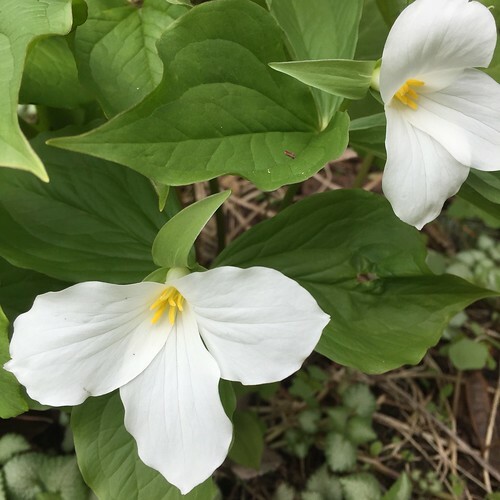 My mom gave me this beautiful Trillium (along with some Bloodroot which has finished blooming) and it IS blooming! Aren't Mom's awesome? Happy Mother's Day Mom! Can't wait to see you. 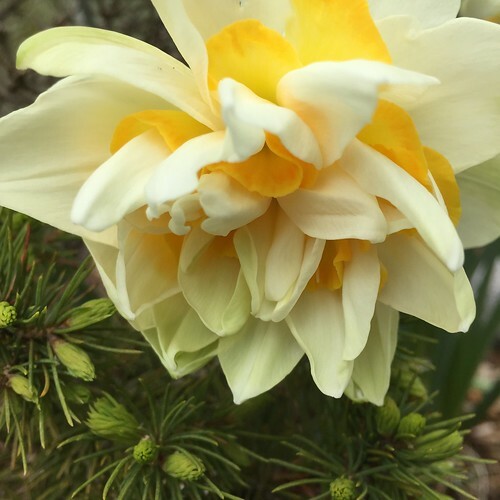 There's nothing like blue in the garden to set off those yellow (white, peach, orange) daffodils! And I got it! 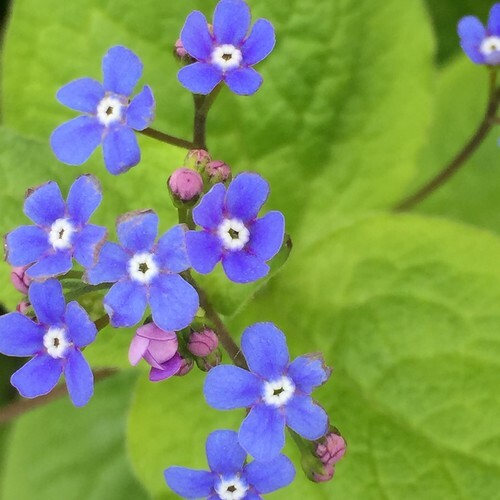 Brunnera is the bluest of them all. 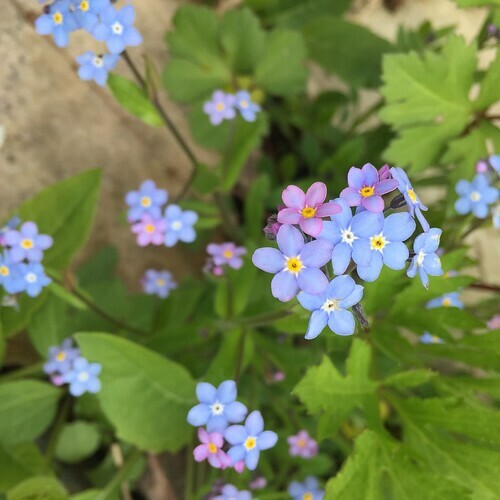 Forget-me-nots are never forgotten and are always enchanting with their tiny, dancing blooms. I love when the bumble bees land on them and sway to the ground. 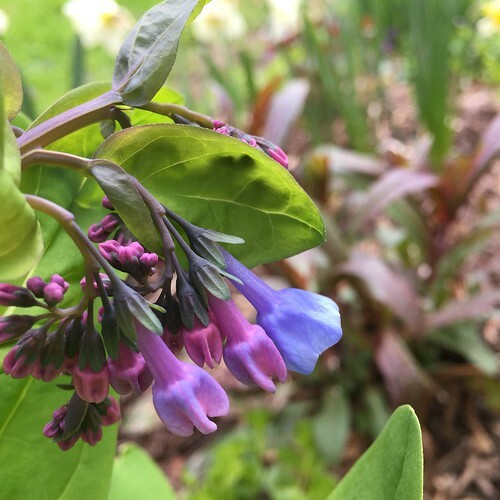 Virginia Bluebells, a native spring ephemeral, has my heart right now. I planted two plants last year with the hope of having a large drift of them someday and they're both up and looking slightly different from one another. 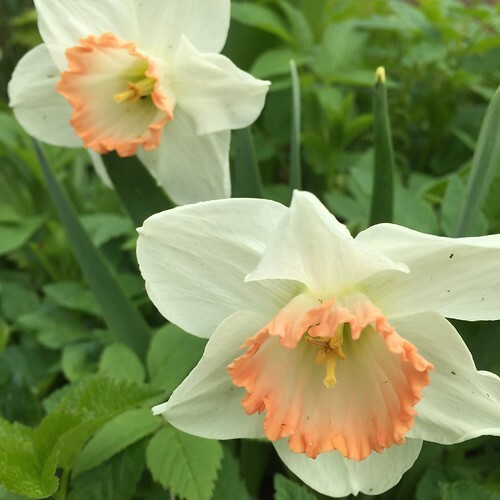 One seems to have lighter green leaves and paler blooms while the other has a little pink in the blooms and deeper green leaves and seems more robust. I have to research and figure that out unless you can provide some insight? 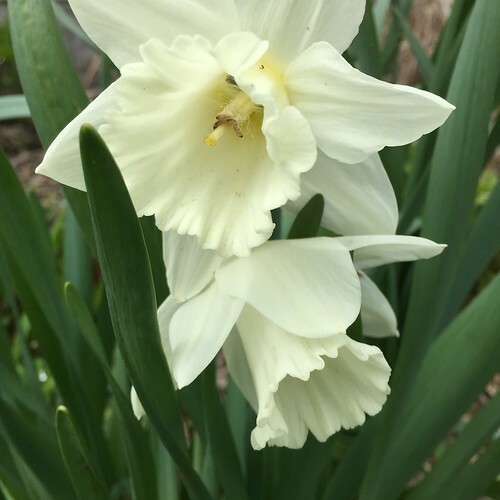 I am reveling in the glory of Spring, grateful to be working in my own garden getting to know her again. The Serviceberry was a show stopper this year but sadly her show does not last very long until the berries. Next, the Dogwoods and Crabapples will be in bloom most likely in time for the Memorial Day Artists' Studio Tour. I hope you'll stop by.